Immanuel is very active in Water Ministry. 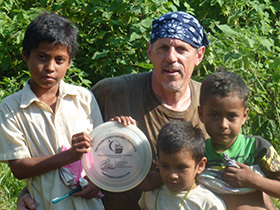 Each year we travel to Central America to drill a fresh water well for a community without clean water. We have drilled wells in Nicaragua, Guatemala, El Salvador and in the fall of 2015 we will drill a well in Honduras. 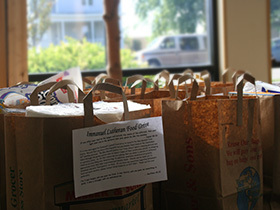 Throughout the year we support Blue Mounds Food Pantry through our donations of food and our volunteer service. Our youth enjoy supporting the food pantry and volunteering to stock shelves. We provide outreach to those that are homebound and hospitalized offering pastoral care and support. Each year we participate in the ELCA’s World Hunger Appeal which provides food and supplies to those that are struggling with poverty. Mt. Horeb is blessed with a wonderful clothing ministry called Community Clothes Closet. Immanuel not only provides financial assistance to the clothes closet but we also provide volunteer support and continual clothing donations. For years Immanuel has been a part of the Red Cross’ One A Week Club where we commit to donate at least 52 pints of blood throughout the year. We appreciate the work of the Red Cross and are pleased to help whenever we can. 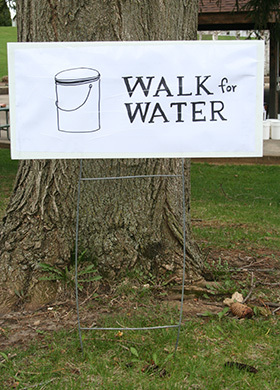 Walk for Water annual fundraiser in Mount Horeb.